Sports Luxe has been hitting the ball out of the fashion park for a while now. Everywhere we turn there is someone rocking comfortable sportswear, whether there is a gym close by or not. Although this relaxed trend may be comfortable and seemingly effortless, it requires more skill and commitment then one might automatically assume. It’s a like-minded theory to the ‘no makeup look’ in which to achieve actually requires a tonne of products. Similarly, when rocking the sports luxe trend you don’t actually wear sports clothes, you just appear to look sporty. This is where some people can go horribly wrong, upon hearing the word ‘sporty’ it is easy to forget all about the ‘luxe’ aspect that is involved in this trend. Luxe means something a little more glamorous than your usual workout clothes so if your sports luxe style has become a little too sports lax, here are some quick pointers on how you can turn your style game up a notch. Sports luxe is all about creating a streamlined silhouette, so if one piece is oversized like a chunky sweater, then pair it back with fitted leggings or a pencil skirt. You don’t want to look sloppy by having too many loose fitting items. When selecting pieces opt for track pants with tapered leg, light anoraks, slim t-shirts and slip on dresses that can make for a killer go-to look when paired with sneakers. There is no need to dress head to toe in sporty elements to pull off this look as it will take away from the effortless, low maintenance vibe you are aiming for. Instead, select one hero piece and pair with other minimal styles. The key to this look is about finding the perfect balance of sports pieces and luxe pieces. 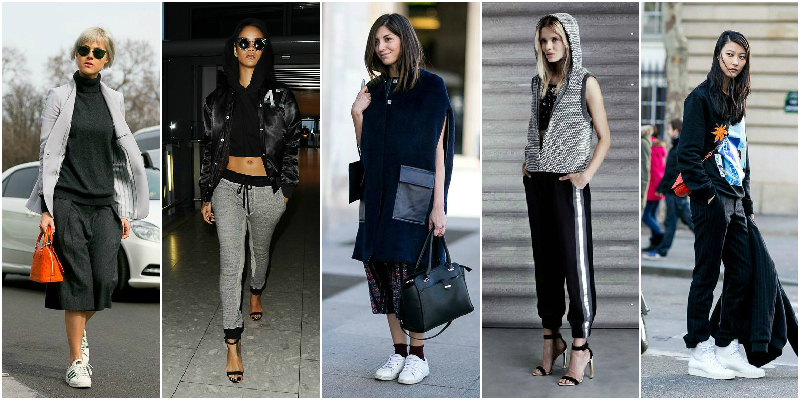 Combine the edgy sportswear pieces with more classic, feminine pieces to balance the look out. Add a tailored coat, a sleek black pointed heel or a red lip to give your sports inspired outfit a feeling of luxury. 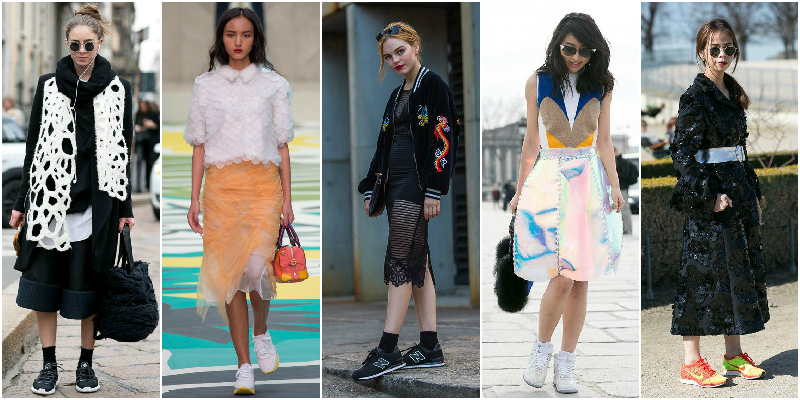 The quickest way to achieve a winning sports luxe ensemble is your shoe selection. There are basically two options here: sneakers (plain white classic styles) or heels. We prefer to style sneakers with pretty skirts and heels with track pants to keep both looks edgy and fresh, but the sky is the limit if you can make it work. Whatever shoe you choose will dictate how the rest of your outfit plays out. 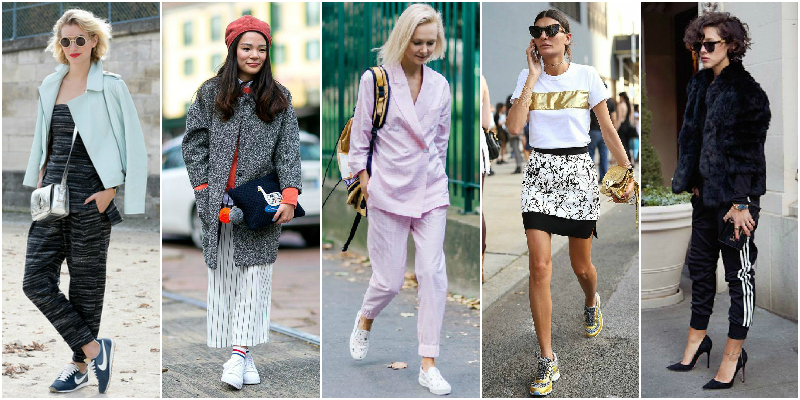 Heels give a more glamorous vibe so opt for sporty clothing, whereas sneakers provide a strong sports element on their own so look for more classic structured everyday pieces to create a the perfect balance. The sports luxe trend has been around for a few years now and has evolved over time, so in order to keep it fresh look for materials that add a new element. Embellished sneakers, luminescent high sheen fabrics, neoprene, jersey and detailing like perforation and laser cutting, give an instant uplift to sports pieces. If you are opting for sporty styles, luxurious fabrics are the perfect way to take your look from drab to fab. 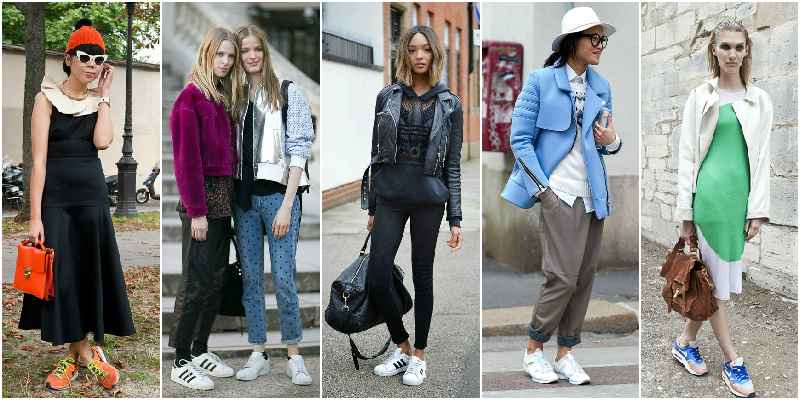 Styling is one of the most important things when it comes to nailing a sports luxe look. For example, a blazer with sleeves rolled up with a relaxed pair of pants, or a midi skirt with sneakers and an oversized sweater is a great way to interpret this trend. Combine sporty pieces with other current style trends for an eclectic fashion mix. When it comes to dressing sports luxe, just do it, but don’t over do it.